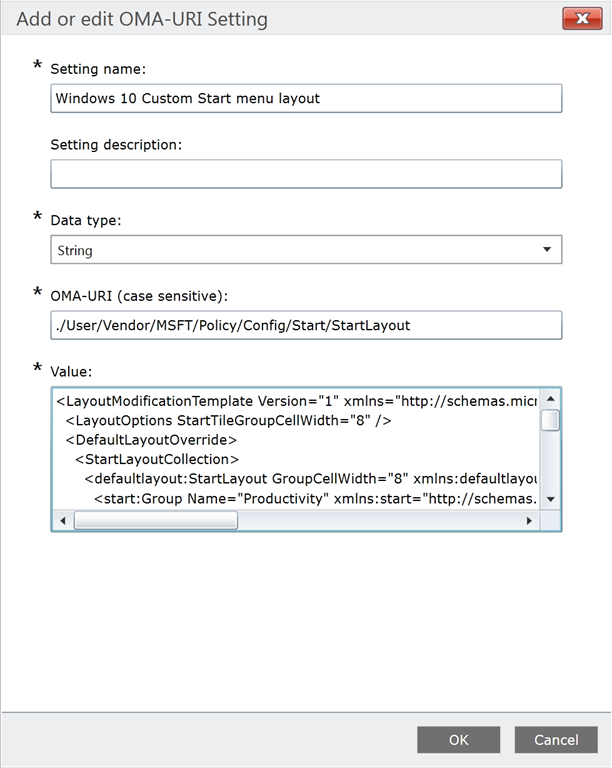 In Configuration Manager/Microsoft Intune, you set the path to the .xml file that defines the Start layout using an OMA-URI setting, which is based on the Policy configuration service provider (CSP). Allows you to override the default Start layout and prevents the user from changing it. This policy is described in Start/StartLayout Examples later in this topic. ./User/Vendor/MSFT/Policy/Config/Start/StartLayout to configure the policy. ./User/Vendor/MSFT/Policy/Result/Start/StartLayout to query the current value of the policy. 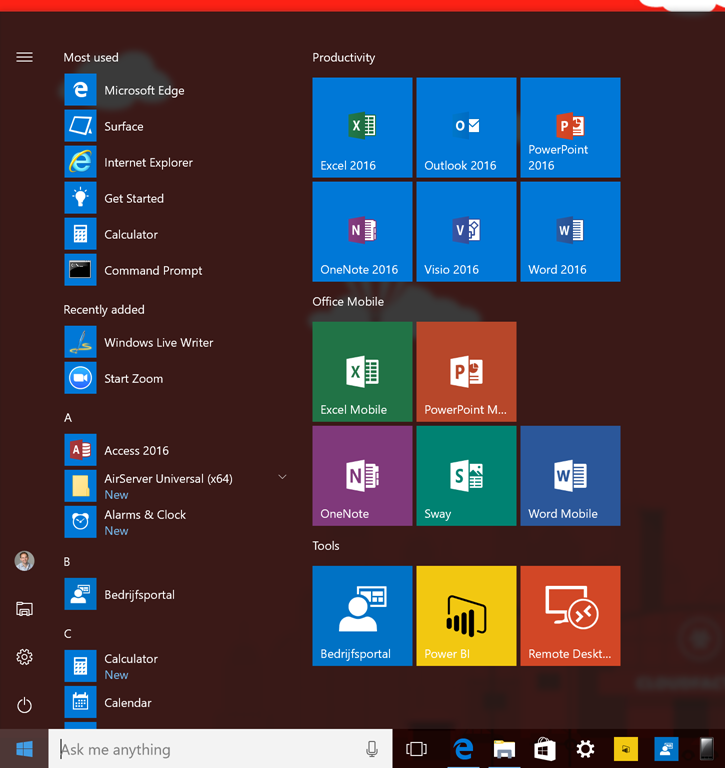 The example below shows my default Windows 10 start menu layout. The easiest way to generate a layout is to set the Start layout on a PC, and then run the PowerShell cmdlet Export-StartLayout. Note The applications in the XML should be available on your target device(s) to get the custom start menu layout presented as intend. 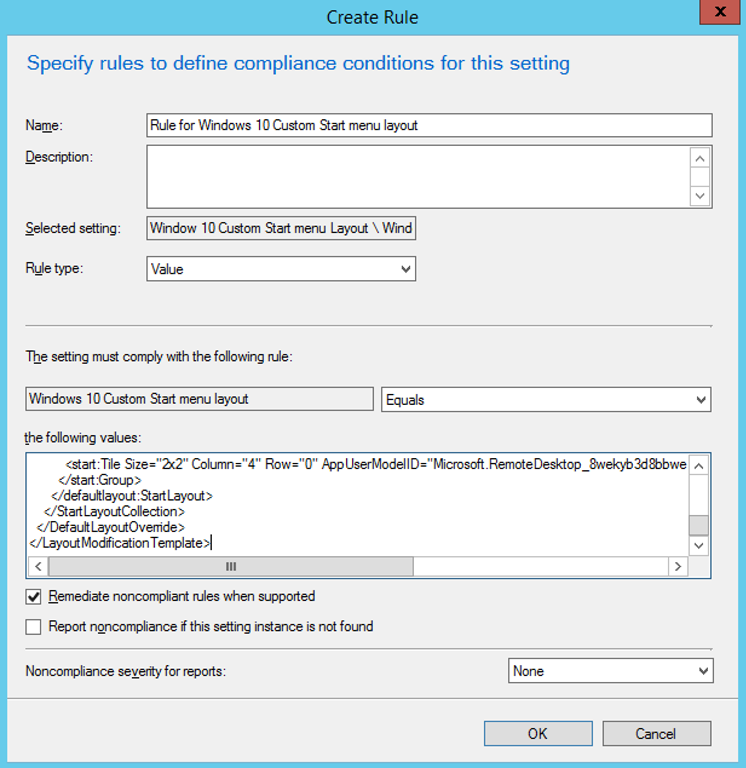 In the Configuration Manager administration console, click Asset and Compliance> Compliance Settings > Configuration Items> Create Configuration Item. Enter a name (mandatory) and description (optional) for the policy. 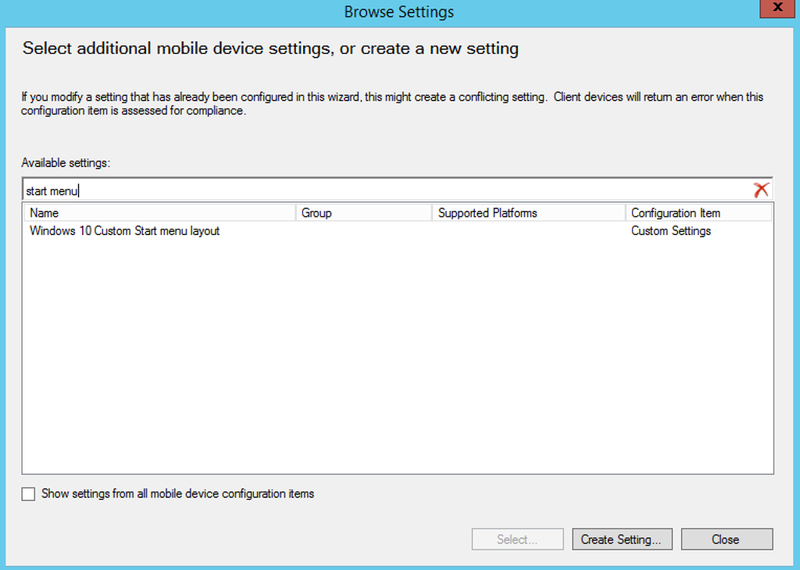 Select Settings for devices managed w/o the Configuration Manager Client (MDM), choose Windows 8.1 and Windows 10 policy. Click Configure additional settings that are not in the default setting groups. Provide a description that gives an overview of the setting and other relevant information to help you locate it. Select Windows 10 Custom Start Menu layout mobile device setting we created in the previous step. 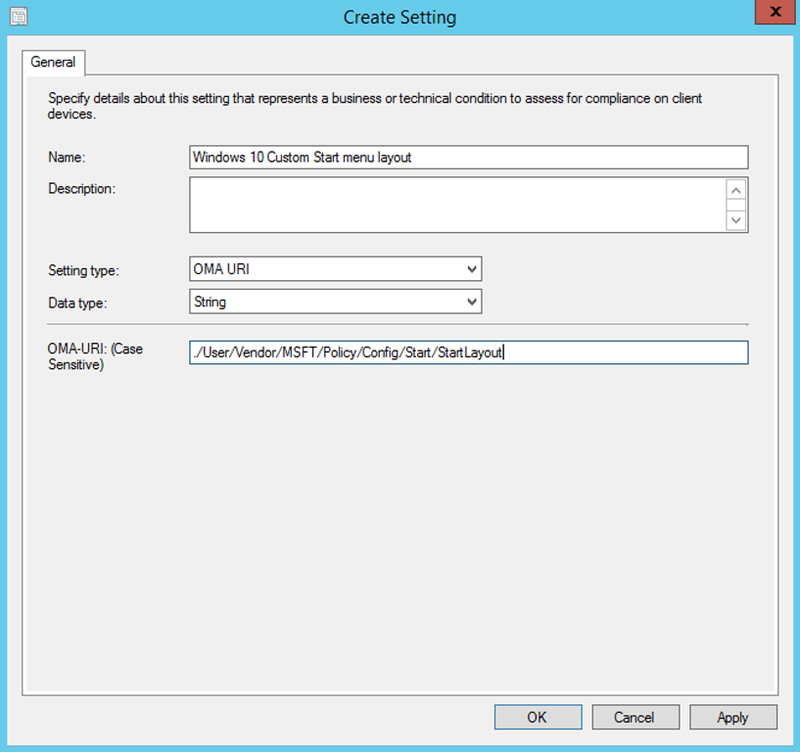 Click OK to save the setting and return to the Create Configuration Item wizard. Under Windows, choose a Custom Configuration (Windows 10 Desktop and Mobile and later) policy. In the OMA-URI Settings section, click Add. In Add or Edit OMA-URI Setting, enter the following information. Enter a unique name for the OMA-URI setting to help you identify it in the list of settings. Click OK to save the setting and return to the Create Policy page. After creating the Custom Configuration (Windows 10 Desktop and Mobile and later) including the custom start menu layout just deploy the policy to the according audience and looking forward to the end results! To get a better understanding of the start menu schema, check this website. It covers items like Tiles, DesktopApplicationTiles, StartLayoutCollection, StartLayout, SecondaryTiles and AppUserModelID. When a full Start layout is applied with this method, the users cannot pin, unpin, or uninstall apps from Start. Users can view and open all apps in the All Apps view, but they cannot pin any apps to Start. When a partial Start layout is applied, the contents of the specified tile groups cannot be changed, but users can move those groups, and can also create and customize their own groups. When a partial Start layout is applied, the contents of the specified tile groups cannot be changed, but users can move those groups, and can also create and customize their own groups. Start layout can only be applied to a device using the same architecture (32-bit or 64-bit) as the device on which Start layout was created. 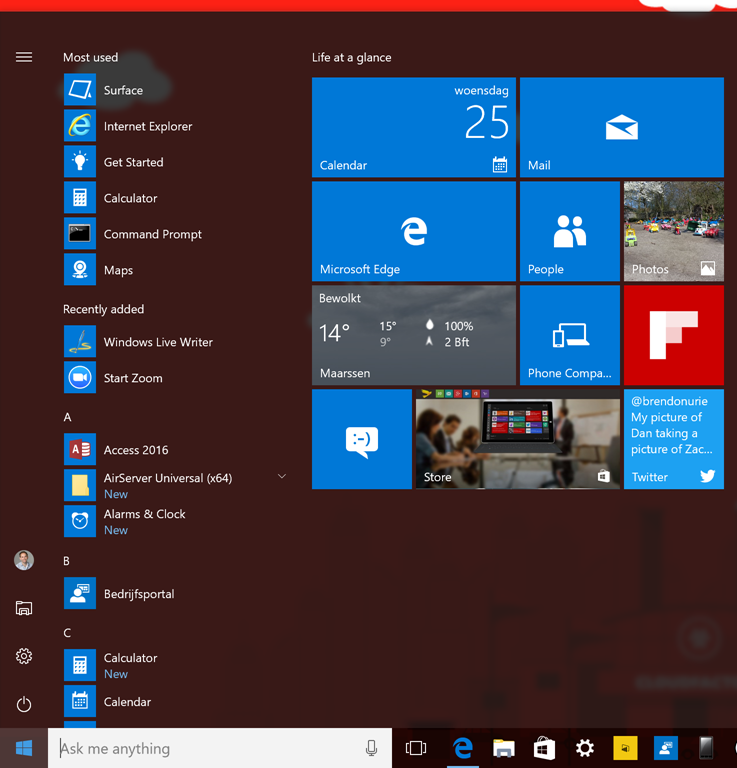 Partial Start layout is only supported on Windows 10, version 1511 and later. Works great! My policy applies before all my applications are deployed. The start layout will not update automatically so I need to change something in the xml to get the start layout updated with the apps I deploy with intune. Am I doing something wrong here? Hi Jim, customizing start menu’s is still a complex and error prone process with some limitations. Some gotchas, special thanks to Paul Huijbregts (MSFT): For MDM Policy, need to escape all XML markup characters. This seems easy but will break stuff! If a pinned App does not exist (yet) on the target machine, it won’t show up. Got the same problem on 1709. I have a ticket at MS support. They could simulate the problem on 1709, not 1703. So its a bug. No workaround for now, so hang on.